...I was in a bind because another car hauler had charged my credit card but never picked up my vehicle. I was embarrassed because I should have researched more having graduated from YALE University. Premier treated me with care and respect from the first phone call. They did everything and more than they promised. My hat is off to Premier. Mercedes arrived in great shape. I have since told my friends at my country club of the first class service. ...Your driver Steve was especially courteous, thank you for another successful delivery. ...Would like to thank you and those who work for you. The pickup and delivery was handled professionally with care and attention for my special vehicle. Thanks again. ...I have used Premier several times to transport my vehicles. Without fail they continue to perform above my expectations. My car was delivered on schedule & in a snow storm... These guys are the best. ...My wife and I travel back and forth from Long Island, NY to Rancho Mirage, CA every year. 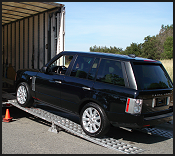 We have used Premier to transport our cars for over 10 years. Schedule is very important to us because we do not want to be without our cars for too long. Premier has always made our needs a priority and the cars always arrive on-time. We really appreciate being able to rely on your service.